Learn how to find, appraise, crop and access data on any Koordinates site. Select the thumbnail or title of your data layer to navigate to its About page. This will provide you with a range of information about your chosen dataset. 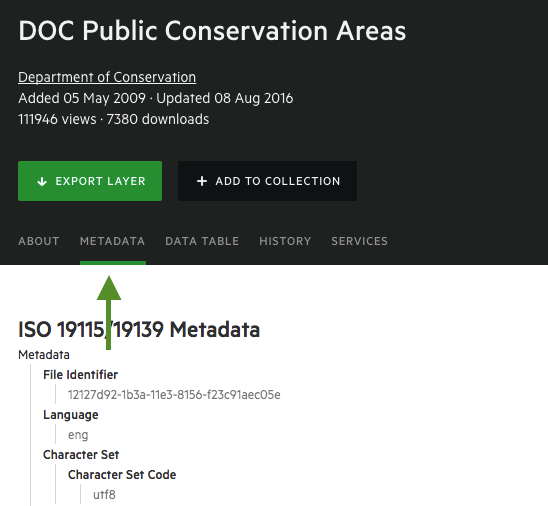 Select the Metadata tab to display the metadata available for your chosen dataset. You are then able to appraise its default metadata schema. Select the drop-down menu in the top-right of your screen to toggle between metadata schemas. Click on their respective links to download the metadata in either XML or PDF.